The Emu bowl on the right could have been yours for the "Anniversary Sale" price of 2/6 (two shillings and six pence, Australian). But you had to be quick, as there were only "ABOUT 700 TO SELL". This was in 1925, when Crown Crystal's Carnival Glass production was in full swing. The Barry & Roberts store was offering a selection of Carnival, every piece being offered in this was in "De Lustre", "Lustre" or "Iridescent" glass. De Lustre / Lustre usually referred to the dark (black amethyst / purple) Carnival while the term Iridescent was generally meant to imply marigold. Heavy Diamonds salad bowl. "8½ inches across. In Lustre or iridescent effects". Gum Tips vases. "De Lustre Coloured vases, good solid stand, varying from 8 to 9 inches high". Diamond sugar basin. "De Lustre". Emu ruffled master berry bowl. "Lustre Colored Fruit Bowls, about 9 inch all over". Banded Diamonds pitcher. "Also in De Lustre and iridescent Colours". Hobnail and Cane exterior. "Comport or Fruit Stand in various shapes, flat, saucer or cupped shape. Also in De Lustre, for fruit etc." The quantities available and the prices shown for these items make interesting reading: 700 Emus! 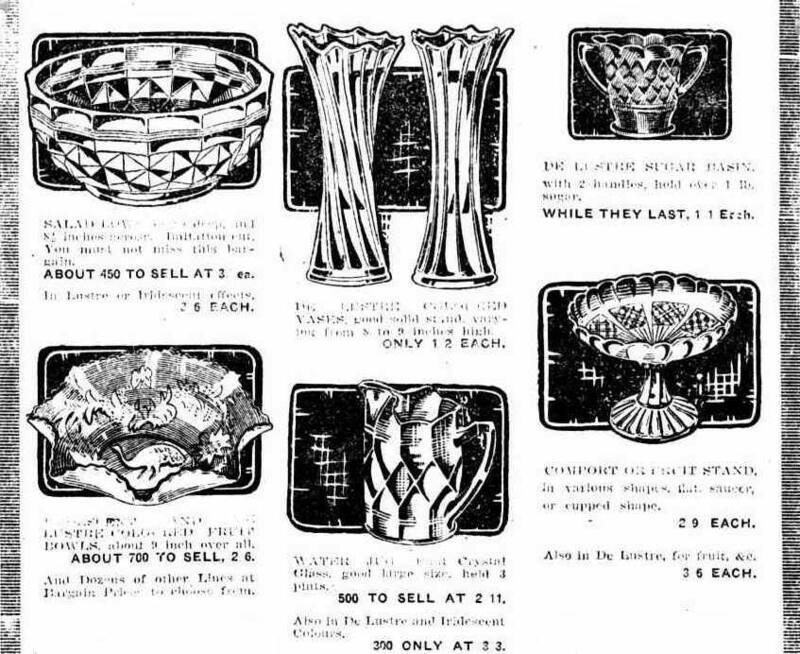 Note the higher prices being asked for some of the Carnival items - the Banded Diamonds water pitchers were 2/11 (two shillings, eleven pence) in plain glass, but 3/3 (three shillings, three pence) in Carnival, and the comports were almost one third as much again, price-wise, in Carnival Glass. The ad above from December 1924, is the earliest illustrated one for Australian Carnival that we have seen. 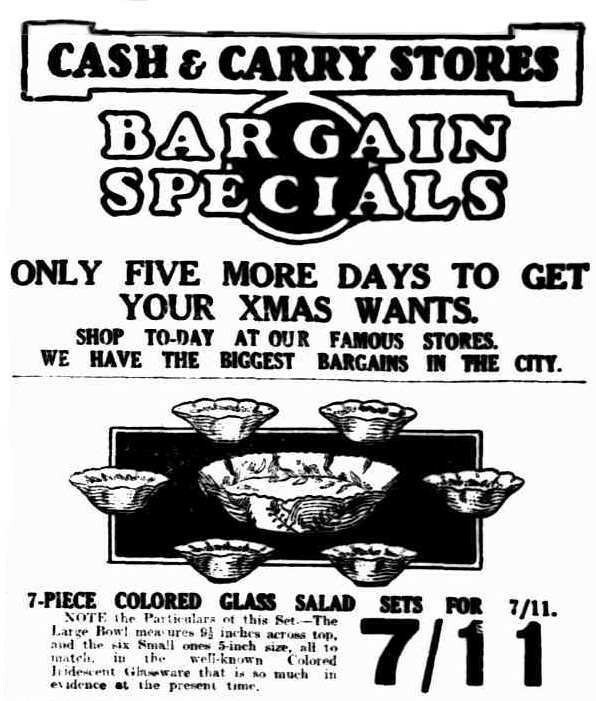 Just five days before Christmas and the Cash & Carry Stores were pushing sales. A seven piece “salad set” was perfect for the warm (in Australia) December days. The print is not easy to read so here’s the text: "NOTE the Particulars of this Set.—The Large Bowl measures 9½ inches across top, and the six Small ones 5-inch size, all to match, in the well-known Colored iridescent Glassware that is so much in evidence at the present time." What pattern is this set likely to have been? The illustration shows a Fern & Wattle exterior but the hint of an interior design suggests the Kingfisher pattern. There lies a puzzle - the Kingfisher bowls have no exterior designs. And to complicate things, there’s several versions of the Kingfisher design! The wonderful ad above from the Brisbane Courier shows a wide range of shapes in “Iridescent Glassware”. The “DE LUSTRE COMPORTS” are described as having “Australian Emblematic designs” while the “IRIDESCENT FRUIT BOWLS” have “Various moulded Australian designs”. Here is one of the items that are depicted in the ad - a “dark” (purple) “De Lustre” Emu comport, a very sought-after item today. In the ad, the patterns are referred to as “very dainty designs”—fair comment! Left: an ad from the 1925 Daily News, Perth. Boans Department Store in Perth had many feature ads that referred to their Wonderful Third Floor Sales. Carnival Glass (referred to as "Aurora" here and in other adverts) was a constant feature in their ads. Boans closed in 1986.